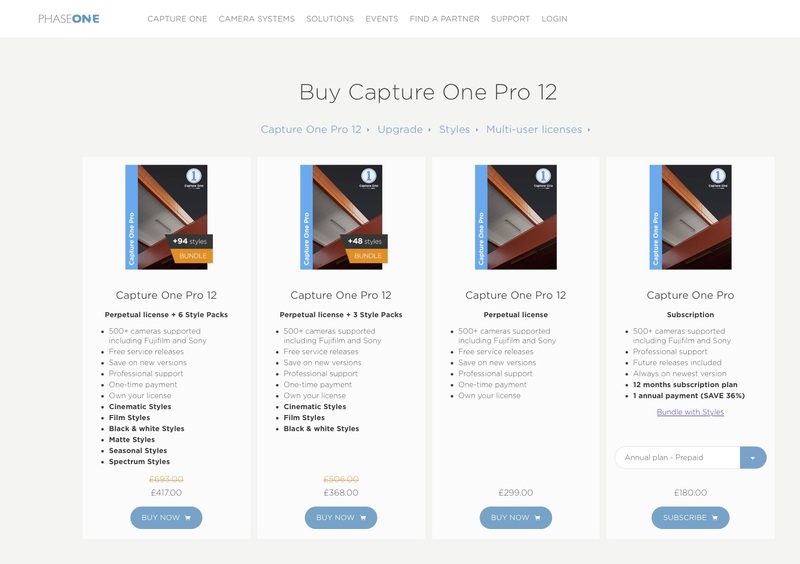 Capture One Pro: Should you buy a perpetual license or a subscription? If you’ve made the decision to use Capture One Pro as you RAW converter and editor then Phase One offers a couple of methods to buy into it. You can either opt for the traditional perpetual license model or pay for a subscription. The price of a perpetual license is $/£ 299 for three seats, which means a single user can install it on three separate devices, so long as they’re not being used simultaneously. As a so-called ‘perpetual license’, you won’t have to update when the next full version is announced, assuming your camera is supported of course. Save 10% on perpetual licenses, upgrades and styles at the Phase One online store until December 31, 2018, when using the AMBCARTER promo code at checkout. Although there’s an argument to keep to the perpetual license for the long-term. Bear in mind that that long-term saving is based on benefitting from a full 12 months of the initial license; in reality you could have bought a perpetual license in October, so you could have just one month before feeling compelled (and having to pay) to upgrade. Service updates are free for the full version and are mainly about bug fixes though occasional features and support for new cameras will be added during the year. Should you want to benefit from major new features, as well as gain support in terms of RAW file compatibility and lens correction profiles for new models announced prior to Photokina, then you will have to and update. Let’s say you purchased a license on, or soon after, the launch day of the latest version, usually at the end of November (if you bought a license for the older version during November speak to Phase One to see if they’ll upgrade you FOC, they might), and you want to upgrade. That will cost $/£ 149 (Single User updating from 11). So for anywhere between 13-24 months the price will be $/£ 450. The price of an annual pre-paid subscription plan is $/£ 180, saving a substantial $/£ 119 in the first year over a perpetual license. Although the total, cumulative cost is $/£ 360 in the second, from 13 up to 24 months, that’s still a saving of $/£90. So based on current prices, they’re hoping to re-coup a little in the successive years. The price of an annual pre-paid subscription plan is $/£ 180, saving a substantial $/£ 119 in the first year. In the third year, for example, a perptual license with two upgrades will have cost you $/£599 for between 25-36 months With an annual pre-paid subscription plan, that will cost $/£ 540, a saving of $/£ 49. In the fourth year, the two will have cost the same but in the fifth year, the perpetual license option will have saved you $/£ 50, providing that the prices remain the same. There are other ways to save as well. If you know that you’re going to be a Fujifilm or Sony user for certain period of time, and don’t require RAW file support of other makes, then select the Capture One Pro for Fujifilm or Sony, respectively. At $/£219, for the perpetual license, they’re some $/£ 80 cheaper initially but cost the same $/£ 149 to upgrade. With an annual subscription there’s no upgrade fee, so if you’re are buying into Capture One in the months leading up to when new version is announced (usually end of November but there are no guarantees), then currently it pays to buy an annual pre-paid subscription. Currently, it pays to buy an annual pre-paid subscription. Again, you can save a little more if you’re sure to remain a Fujfilm or Sony user for a few years by taking out a Capture One Pro for Fujifim or Sony pre-paid subscription. Save 5% on subscriptions at the Phase One online store until December 31, 2018, when using the AMBCARTER promo code at checkout. If you’re still resistant to paying 12 months in advance, Phase One offers some flexibility which could prove attractive. If you pay monthly, and agree to an annual plan it will cost $/£ 20 a month, or $/£ 240 per annum. Still cheaper initially than the perpetual license. Contrast this with the monthly payment of $/£ 24, or $/£ 288 for 12 months. Although the priciest option for potential subscribers, it remains cheaper than the perpetual license option. If you found this feature useful, please consider buying a license or subscription through our links. Sales through these links may earn us commission, which helps the running of this site. ← Loupedeck+ review: The future of image editing?